1. Snapchat reports major DAU crash, but revenue and share price both rise so what does this mean? Okay, let’s start with one of the biggest social stories of last week. Snapchat’s Q2 earnings report revealed a 3 million drop in daily active users (DAUs) month-on-month, falling from 191 million to 188 million. From the moment the report was released, my inbox was flooded with emails – most of which shared a “Snapchat’s in trouble here” kind of vibe. And to be honest, it’s difficult to disagree. The DAU drop is the first of its kind for Snapchat, a company for which user growth has always been a strong point. On top of that, anyone in the know appreciates that Snapchat’s been fighting an uphill battle against powerhouse competitor Instagram. The app has also faced huge backlash to its redesign, which was released earlier this year. GDPR compliance might have also impacted the DAU drop – but then again, this is something all platforms have had to contend with. But here’s the twist: the earnings report wasn’t all bad news. It showed 44% year-on-year revenue growth, with the company bringing in $262 million in Q2. While this is lower than Q4 2017’s results, it’s $32 million more than Q1 2018. Snapchat’s losses are also decreasing, although that’s just a polite way of saying its still not making any profit. In other interesting Snapchat news, which could possibly be another signal of better times for the app, it’s just had a serious cash injection thanks to the Saudi royal family who have invested $250 million (as reported by Tech Crunch). It will be interesting to see what this could lead to. Whatever happens, one thing’s for sure: Snapchat’s gotta pull something out of the bag. Part of Facebook’s mission to make the platform a domain for meaningful interactions involves enhancing the sense of community for users, both online and offline. This week, the company has added a ton of new features to help people connect with more businesses – particularly smaller, local businesses. Recommendations are being added to Pages: these will appear in the form of written reviews (at least 25 characters long) that can include photos and business tags. These tags are worth keeping an eye on; suggested tags will show based on past recommendations, and Facebook will use tags to help categorise your business. Pages will also be able to report recommendations – which should help stop competitors trolling each other. Prominent action buttons are being added to Pages: the action buttons will make it easier for users to “interact with a business and find what they need the most” e.g. booking an appointment or buying a ticket for an Event (directly within Facebook). Stories rings are being added to profile photos: a glowing circle will appear around profile photos to indicate when a story has been published. Users can then tap to watch, just like on Instagram. Job application tool is rolling out worldwide: the feature makes it quick and easy to find and apply for a role within Facebook. “Local” section is being added to the Facebook app and desktop: you’ll now be able to view this outside of the standalone Facebook Local app. It will feature businesses in the local area, places that have been highly recommended and events that are being attended. New research published by Bazaarvoice has uncovered some interesting consumer views on influencer marketing. Partnering with a social celeb might feel like a sure thing when it comes to driving engagement and followers for your brand, but is that really always true? And even if it is, how long will it stay true for? With so many brands using influencer collabs these days, it seems like social media users might be getting a tad fed up. The study, which interviewed consumers from across Europe, found that repetitive content (47%) and dipping quality (23%) are the top customer concerns about influencer marketing. While the study provides some helpful and thought-provoking insights, it’s fairly small scale, and also only Europe-based, so perhaps not representative of global attitudes towards influencers. There’s clearly still a lot of potential when it comes to this type of marketing – but perhaps we need to recognise the practice could need a bit of freshening up to keep users on side. 4. LinkedIn rolls out voice messaging, but does anyone actually want it? Confession time: this news is actually from a couple of weeks ago. It’s been on my radar to tell you about and, as I didn’t get a chance in the last couple of Digital Dashes, I wanted to update you this week. So LinkedIn is introducing voice messages to LinkedIn Messaging. Voice messages can be up to one minute long, and all you have to do to record one is tap the microphone icon in the mobile messaging keyboard, then tap and hold the microphone in the circle. Releasing your finger will send the message. The feature should be available now in the LinkedIn app on iOS and Android. I can see why LinkedIn has made this move. Voice messaging and voice assistants are a huge trend right now, and for good reason: sometimes it’s just so much more convenient to talk than type. But how well suited to this kind of functionality is a professional platform? So far, I’ve heard mixed reactions to the news. Some seem to think it will be really useful, others are not looking forward to drowning in voice-message spam and think this whole thing is a terrible idea. We have a rule here at SMSW that we only tell you about rumours if they come from a credible source. Well, you’re in for a treat today because not only do we have a seriously exciting rumour to share, but it comes from a seriously credible source: Mr Jon Loomer (via one of his Power Hitters club members Florian Litterst). So now I’ve hyped this up, let’s dive into what it actually is. Florian sent Jon a spotted-in-the-wild screenshot of what looks like a new attribution feature within Ads Manager. 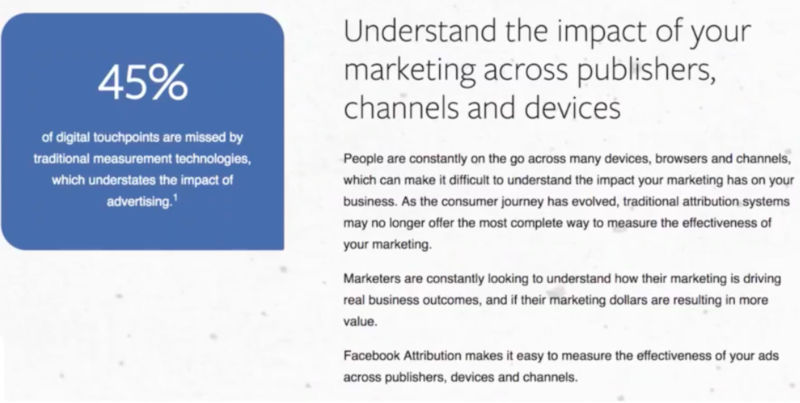 Now, you might already know that some pretty cool attribution features exist within Facebook Analytics and its funnel functionality – but this is different. This rumoured new tool might be able to provide attribution insights across all online channels, not just Facebook. Provided the Facebook Pixel is installed across them all, of course. This would be game-changing, and could place Facebook ahead of even Google Analytics in terms of digital attribution. So the feature could potentially tell you what weight an email, for example, had in a final action being taken (usually a purchase). This ability combined with Facebook’s insane bank of signed-in data (allowing for cross-device tracking), gives it the edge over the likes of Google and means that it could be capable of producing the most granular user journey insights yet. As soon as we hear more about this, you’ll be the first to know.